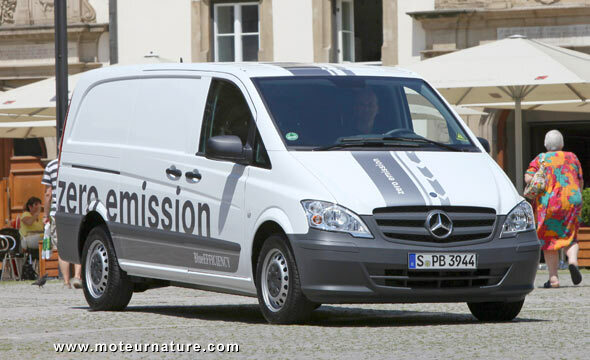 The Vito is the smallest commercial vehicle from Mercedes. Smaller than the Sprinter, which is the only commercial Mercedes available in the USA, the Vito is smaller than a Chrysler minivan. Well today’s Chrysler’s minivan. If you remember the original Chrysler minivan from the eighties, today’s Vito is barely larger. Its compact size makes it a favorite for urban deliveries in Europe’s congested cities. And when it comes to urban driving, nothing beats an electric powertrain. 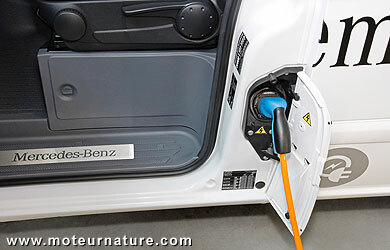 Mercedes knows it, the German manufacturer has been studying electric drive systems for several decades, and it has already started the production of a batch of 1500 electric Smart Fortwo. Mercedes has been working on an electric Vito for several years, and the press has first heard about this prototype early this year. It was announced at the time that Mercedes would build one hundred for testing purposes with selected customers. Well, that was only a few months ago, but things have changed. The commitment to 100-vehicles has been upped to 2000! 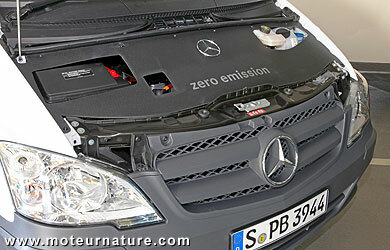 This electric Vito has a 60-kW motor (70-kW peak), with a 36-kWh pack of lithium-ion batteries. These are automotive cells, 192 of them, not the consumer cells like those found in a Tesla roadster. They’re supposed to be longer lasting, and more resistant to extreme heat or cold. Customers will find out, range is about 85-miles. 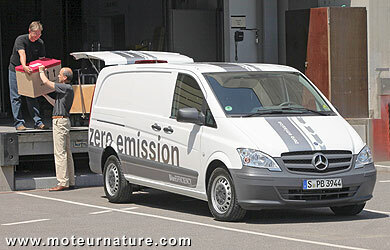 The electric Mercedes Vito will be produced on the normal Vito production line, alongside regular diesel models. First deliveries are expected next year.